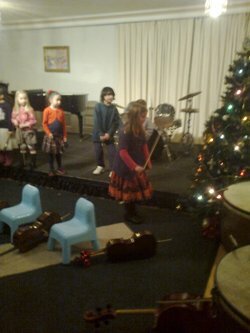 For an enthusiastic and very young group of violinists and cellists led by Vanessa Moore (violin) and Emmanuelle Dumas (cello), this Christmas Concert provided another great opportunity for these young children to get further accustomed to performing in front of an audience. There was a fun and gentle atmosphere throughout the whole event, and one particular highlight was the children placing decorations on the Christmas tree using their violin and cello bows! (pictured).